Étienne Richard: Complete Suites for Harpsichord & Organ. Linda Burman-Hall, harpsichord & organ (harpsichord by William Dowd, Boston 1981, after Michael Mietke, Berlin, 1716) 1/5 comma meantone tuning. Charles Fisk “meantone” organ, Memorial Church, Stanford University Catherine Liddell, lute. Lute contraparties composed by Robert Strizich. There are many ‘firsts’ on this compact disc. It is the first recording of the complete works of Hardel, a prominent harpsichordist in the musicians circle at the court of the young Louis XIV, which included Louis Couperin, Chambonnières, D’Anglebert, Dumont, Richard and Froberger, to mention only the harpsichordists. Similarly Étienne Richard, who was harpsichord teacher to the king, is represented here for the first time, in his complete works for keyboard. 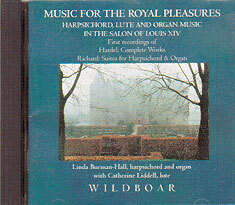 One of Hardel’s suites is here set with a lute ‘contrapartie’, a known practice of the time, composed by famed lutenist Robert Strizich, and performed by Catherine Liddell. The harpsichord is William Dowd’s first copy of the Michael Mietke instruments in the Schloss Charlottenburg, Berlin, the earliest example in modern times of this now-popular model. Strung entirely in brass, the Mietke has many characteristics in common with Italian harpsichords, and especially with seventeenth-century French instruments. The organ is the last instrument built by the C.B. Fisk Organ Works of Boston during the life of Charles Fisk, its founder and designer of this instrument. It is one of the largest organs in the United States tuned in meantone tuning, and with many stops of French design is eminently suited to French music of this period. The Fisk has an ingenious mechanism by which its tuning may be changed from quarter-comma meantone to ‘well-tempered’ tuning. Several extra pipes per octave are provided for the purpose. Dr Burman-Hall has included generous, scholarly and readable notes to accompany the recording, with fresh, insightful information on these little-known composers.